A visitor at “All Power to the People: Black Panthers at 50,” an exhibition at the Oakland Museum of California. Photo courtesy of Odell Hussey Photography/Oakland Museum of California. Engagement has been part of our institution since its founding in 1969 as the “museum of the people.” A multi-disciplinary museum of California art, history and natural sciences, OMCA strives to connect our community and our visitors to the places, people, heritage, and creativity of our state through our exhibitions and programming. Over the past several years, though, the OMCA has been on a journey to bring community engagement to the very core of our organization. 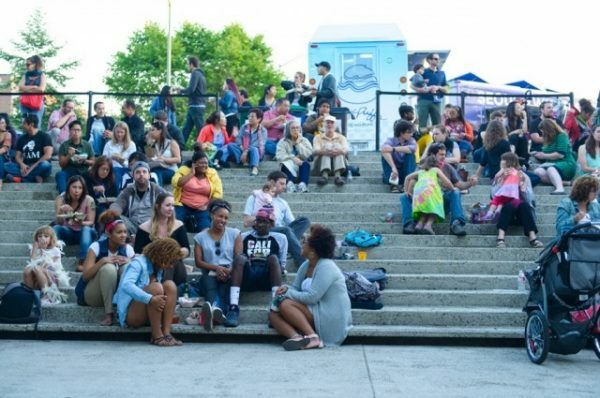 We have made an even more concerted effort to see our mission as broadly embracing social impact and civic well-being—thanks in large part to support from the James Irvine Foundation through the New California Arts Fund, a statewide initiative that supports organizations in better engaging with new audiences and particularly low-income communities and communities of color. The Black Panthers exhibition is part of those efforts. The history of the Panthers is, at its heart, an Oakland story, just like our museum. The Black Panther Party was founded in the same place and time as the Museum. When our building opened in 1969, the Party was mobilizing mass protests across the street at the Alameda County Court House. After Party co-founder Huey P. Newton was released from jail in 1970, he moved into the top floor of an apartment building just blocks from the Museum. Adjacent to OMCA is the Oakland Civic Auditorium, a building that held many large-scale community events, including a July 1969 conference organized by the Party that brought together leaders from civil rights organizations around the country. 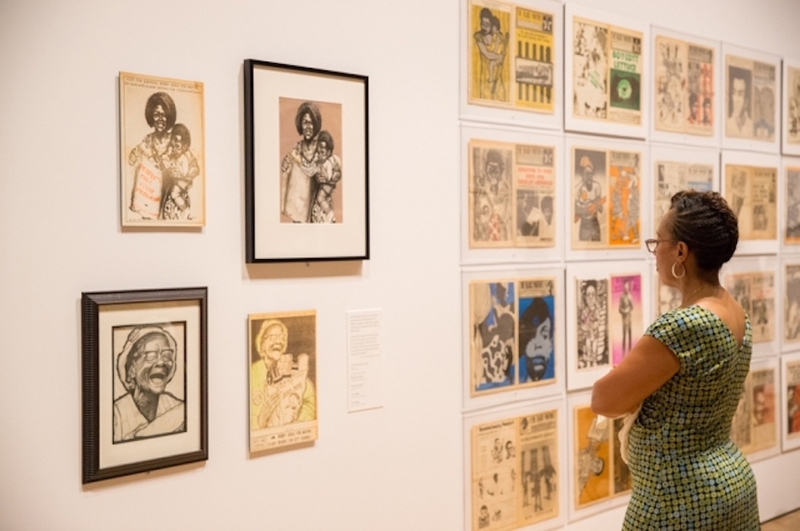 Vistors enjoy “Friday Nights @ OMCA,” a program of the Oakland Museum of California, during the exhibition “All Power to the People: Black Panthers at 50.” Photo courtesy of the Oakland Museum of California. In 2014, with the 50th anniversary of the Party two years away, the Museum began to develop an exhibition that would tell more of the unknown story of the Black Panther Party. OMCA staff worked extensively with former Party members, scholars, artists, and civil rights leaders, including leaders of the coalition Movement for Black Lives (the coalition that includes the organization better known as Black Lives Matter), to bring personal stories, multiple perspectives, and creative responses together with contemporary art works, historical artifacts, and commissioned media pieces in an immersive way. As an institution, we had a number of major goals for this project. We hoped to share a deeply local story that also had broad relevance for California, the nation, and even the world. We also aspired to connect events and movements that took place 50 years ago with what is happening in our streets, courtrooms, and civic institutions today. And, yes, we hoped to engage new audiences—including audiences that may never have come to OMCA. Not everyone in our community was enthusiastic about our decision to embrace this subject. We got questions about whether we would tell “both sides of the story.” We were asked about whether we were glorifying a group that promoted violence. We knew we could face potential pushback both from more traditional Museum supporters and from people affiliated with the Black Panther Party about the legitimacy of a “mainstream” institution representing this still-contested history. The exhibition opened on October 8, 2016—just one month before the presidential election. Throughout the development of the show, we had been thinking about incidents of young black men being killed by police and the resulting Movement for Black Lives. But the election hadn’t quite figured into our thinking. The exhibition and its programming took on new, even greater, relevance after November. For example, on January 21, 2017, the day after the presidential inauguration, the Women’s March took place right outside our front door while, inside our theater, the Panther Party co-founder, Bobby Seale, spoke at a public event with the poet and activist Chinaka Hodge. What had always been a timely show suddenly felt different. Very urgent. People hungered for a place to come together to remember, to hope, and to feel empowered, just as they had 50 years ago. “All Power to the People” provided that space. Over the four-and-a-half months of the exhibition, more than 84,000 people attended, including close to 45,000 in the month of February alone. Lines stretched around the block during the culminating days. Seven hundred people joined the museum as members in the last five days in order to be sure to get into the show. We reached capacity in the gallery, since people stayed, and stayed some more, in the space. Indeed, our visitor tracking indicated that people spent two to three times as long as they do in typical museum exhibitions. Moreover, 62 percent of the visitors surveyed were people of color and 30 percent were visiting OMCA for the first time. The exhibition succeeded according to less traditional measures of engagement as well—such as the number of times a visitor reaction took our breath away (as when a grandmother pointed herself out to her young grandson in a picture of a protest at DeFremery Park). Or left us in tears (as many of us were at the opening when former Panthers and OMCA supporters gathered as if it were a family reunion). Or gave us hope. Or made us believe that a revolution is still possible (a belief reinforced by the many middle and high school students who came on field trips and then returned on their own with family and friends). Which brings us to the final Friday before the Sunday closing of the exhibition. René de Guzman, the curator of the show and the Senior Curator of Art at OMCA, received a text while we were in a meeting together at the end of a long afternoon. 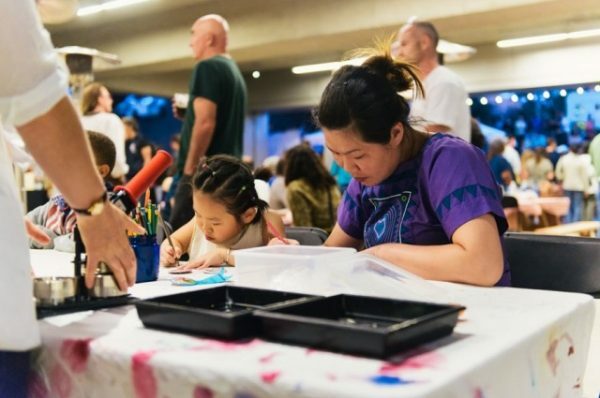 OMCA is open late, until 10 p.m., for Friday Nights @ OMCA, a program that includes food trucks, live music, hands-on activities for kids, and other programming. It regularly attracts thousands of visitors. We already knew we would be packed that evening and it was an all-hands-on-deck affair for staff—to help with greeting guests, signing up new members, and generally ensuring a positive experience for the long lines of people. The text was from one of the most well-known and beloved former leaders of the Black Panther Party, Ericka Huggins. Ericka asked René if she could bring a few special guests to the show that evening. We all took a deep breath, knowing that navigating special entry on this particular night was going to be tricky. René asked for the names. Ericka responded: Lezley McSpadden, Michael Brown’s mother; Gwen Carr, Eric Garner’s mother; Tressa Sherrod, John Crawford III’s mother; and Wanda Johnson, Oscar Grant’s mother. Ericka was bringing members of the Mothers of the Movement—a group of activists whose children had been killed by police violence—to experience the OMCA exhibition. We passed the phone around the table to take in the implications of this message—and the trust and pride that it represented. For many of us, that moment meant more than even the lines around the block or the new member sign-ups. As OMCA has evolved in our engagement work, we’ve had some successes, some set-backs and challenges, and many discoveries. This was a moment, though, in which we came to understand what engagement feels like at a whole different level. Lori Fogarty has been executive director and CEO of the Oakland Museum of California since 2006. She was formerly the director of the Bay Area Discovery Museum and senior deputy director of the San Francisco Museum of Modern Art.